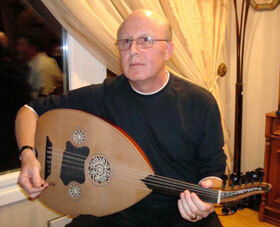 Our beloved composer and Oud player Gabi Chamoun departed on Saturday the 3rd of November 2007 after a heart attack. Gabi Chmoun was born in 1954 in Kamishly. He searched and found classical oriental music recordings in the archive of the composer Georges Chachan who established a contact which developed to a cooperation in musical works. classical music. In Syria Gabi Chamoun wored as a music teacher and composed a musical for children talking about peace in the world. Thereafter Gabi Chamoun immigrated to Sweden and later on to Germany where he lived permanently in Bremen. At the age of 53 years Gabi Chamoun departed leaving his widow Florence and two sons Ninib and Michel. Syriac Music´s deepest condolences to Gabi Chamoun´s family, friends and the Syriac communities in the world.